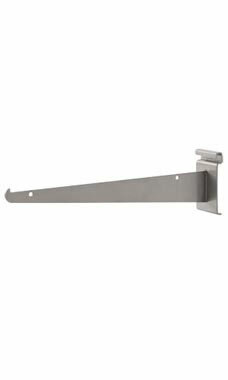 These metal brackets are great for holding up shelves on Gridwall or Wire Grid. Measuring at 12”, these brackets are perfect for shelves that are about a foot in width. Also, the bracket easily attaches to any wire grid panel, and securely fastens to shelves for a beautiful display in your showroom! Each shelf requires two brackets. The contemporary finish of this piece looks great and coordinates with the rest of our raw steel collection, but can fit into any of our other collections as well. In stock and available for shipping immediately.